The Las Vegas Aviators, Triple-A affiliate of the Oakland Athletics, will play at brand-new Las Vegas Ballpark in 2019. In 2018, Las Vegas' Minor League Baseball team was called the 51s and played at Cashman Field as an affiliate of the New York Mets. 2019 marks the start of a new era. On Saturday, the Pacific Coast League club unveiled its new name: the Aviators. Triple-A affiliate of the Oakland A's, the Aviators will operate out of brand-new Las Vegas Ballpark in nearby Summerlin, Nevada. Saturday's unveiling comes at a time of particular prominence for professional baseball in Las Vegas as the Winter Meetings are taking place there Sunday through Thursday. The Aviators are owned by the Howard Hughes Corporation, which also owns the master-planned community that is Summerlin. Located in Las Vegas Valley, Summerlin comprises over 225,000 acres of land. This land was originally purchased by Hughes in 1952 (he named it "Summerlin" after his grandmother, Jean Amelia Summerlin). Hughes, who first made his mark in the film industry, was an aviation pioneer. In addition to being a groundbreaking pilot, he founded the Hughes Aircraft Company in 1932. The Aviators name, therefore, is a direct reference to Hughes' legacy. "[Hughes] had an affinity for Las Vegas. He spent a lot of time here, and flew planes over Lake Mead and the mountains of south Nevada," said the Howard Hughes Corporation's Thomas Warden, who serves as Summerlin's senior vice president for community and government relations. "In the 1960s he came here and lived here for a while. He had quite a profound effect on the city. He changed gaming forever, as one of the main drivers in changing the casinos from private ownership to corporate ownership. "And the aviation part of it, it's such a strong part of who he was. His first love," Warden continued. "So the idea was that we would name the team in a way that went right to the heart of his first love. He had a profound influence on aviation research. ... He would test his own planes out, and was fearless in doing so." The Aviators' logos were created by The Studio, a New York City-based Howard Hughes Corporation design team. The primary logo -- featuring a navy blue, orange, tangerine, gold, yellow and gray color scheme -- depicts a "heroic aviator." The town of Summerlin's logo, which features a silhouette of a Red Rock Canyon Conservation area mountain range, is reflected in the aviator's sunglasses. These mountains are also incorporated into a supplementary mark featuring a connected "LV." "We have a very strong focus on an active outdoor lifestyle [in Summerlin]," said Warden of the mountain range's inclusion in the logos. "There's good weather year-round, trail systems, outdoor park activites, and we're next to the Red Rock conservation area." Summerlin is already home to the City National Arena, the practice facility of the NHL's Las Vegas Golden Knights. Las Vegas Ballpark represents another premier attraction within the rapidly growing community. The Aviators franchise was founded in 1983 as the Las Vegas Stars, the same season Cashman Field opened. "This team is the longest-running professional sports team in town. To get a new home, in a state-of-the-art stadium, as part of a vibrant community ... it's a huge step up for baseball in Las Vegas, and it's happening at the same time as an explosion of sports interest in this town. It's almost a rite of passage, as if the city of Las Vegas is growing up. The timing seems very appropriate for this team to be in a new home." 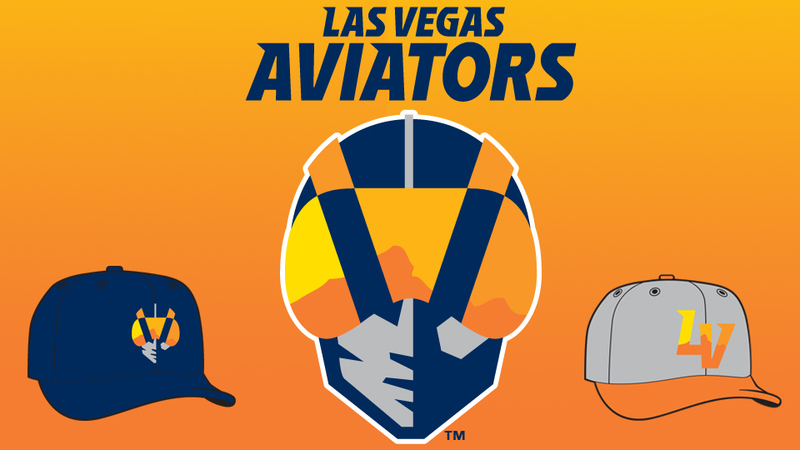 The Las Vegas Aviators make their debut at Las Vegas Ballpark on April 9, 2019, against the Sacramento River Cats.